The seven emotional needs of a child. Unmet emotional needs can inhibit a child’s future. A child whose emotional tank is regularly filled, however, is typically more resilient and less peer dependent, as well as more likely to become a confident and responsible adult. A child has seven emotional needs. These seven needs form the acronym PARENTS, as children’s basic emotional needs include Protection, Acceptance, Recognition, Enforced limits, Nearness, Time and Support. Children need to feel safe. They need a home where conflicts are resolved quickly and respectfully and where a parent’s behavior is predictable and trustworthy. Trust flourishes in homes where children know they can run into their Mom, Dad or caregiver’s arms at any moment and find love and support. Without a healthy capacity to trust, intimacy and interdependency become challenging, if not impossible, to experience. And when a parent struggles with intense mood swings, an addiction, explosive anger or chronic anxiety, a child feels abandoned, unloved and fearful. Children are unable to fully understand and accept parents’ good reasons for being preoccupied about the bills, angry toward a spouse and worried about a chronically ill relative. Kids simply feel the absence of a dependable and caring adult, and react with feelings of hurt and resentment. Children crave acceptance. They crave it from their peers, teachers, coaches and, most importantly, they crave it from you— their parents. Children desperately want to know that despite natural limitations, physical imperfections and marginal performance levels, they are still worthy of love. Our response to our children’s need for acceptance is their primary source of self-perception. We are the first mirror at which our children gaze. Our children look at our faces and see a reflection of their worth and value— or lack of it. If our typical response to our child is patient and respectful, our child’s general view of himself will be positive. If, however, we are routinely critical and harsh toward our child, his beliefs about himself will be negative, resulting in low self-esteem and corresponding behaviors that are often self-sabotaging in nature. It crushes a child to feel like a failure in his parent’s eyes. Though at times their desire is disguised, your children have a profound yearning to please you. They need to hear parents say: “I’m proud of you. Good job. I respect you.” They need to feel your approval. Indeed, if approval is withheld or lacking at home, a child eventually loses hope in receiving approval. As a result, such a child often becomes sullen and cynical in disposition. The effects of this despair are far reaching. Children from homes that are high on expectation and low on affirmation commonly grow up with a nagging sense of inadequacy. Their emotional logic tells them that if they are unable to win their parents’ approval, they must be deficient in some way. They conclude that they are “not good enough.” As they mature, they may resort to compulsive people pleasing to gain what was lost in childhood, or demonstrate excessive work habits in an angry attempt to prove to themselves and others that they are good enough. Paradoxically, a lack of recognition in childhood can cause adults to retreat into unproductive lives and fall short of achievements well within their grasp. Their haunting sense of inadequacy may precipitate chronic procrastination, avoidance of responsibility and self-defeating behaviors. In short, the pain of criticism, disapproval and rejection is so great that they avoid the risk of responsibility and even success. Kids need reasonable, clearly communicated and enforced boundaries at home as much as they need them on the softball field. Without rules, a child feels desperate, aimless and afraid. Without loving discipline, children feel a lack of protection and care. Sometimes “acting out” is the way a child expresses a need for structure and safety in what he senses is a chaotic, unpredictable and threatening environment. In a sense, a child really does ask for discipline. Firm guidance and boundaries demonstrate our willingness to help our children find the control they seek. Kids need parents and caregivers who love them enough to say “no” and mean it. They may even feel resentful toward parents who don’t set limits. Kids want a parent they can respect and trust. They need a parent, not a pal. Hugging, holding and even affectionate wrestling with your child deposits memory sensations of comfort and security that endure throughout life. Likely, the most powerful way to assure a child that he is loved and safe is to hold him in your arms. Children think concretely— they are hands-on learners. Your arms and hands provide a child with a deeply assuring sense of protection, comfort and worth. How does a child spell love? T-I-M-E. Kids need lots of it— both quality and quantity. Good relationships require focused attention (quality) and lots of time together (quantity). Having fun with our kids simply by playing with them sends a powerful message: “You are interesting, fun and worth being around.” It’s not enough for our children to know we are present; they must know we enjoy being present with them. When we chase, laugh, tickle and tease, we are authentic, spontaneous and our real selves. Our children know the difference between parental duty and joyful celebration, and long for the moments when we enjoy playing a card game, reading a storybook and going on a backyard camping trip. A careful look at our datebooks may reveal that the problem isn’t so much a shortage of time, but how we spend it. Though many parents feel the need to work long hours in order to put food on the table, censuses show that the majority of us work to put stuff in the garage. Though it may feel, at times, like we are compelled against our will to carry a staggering workload, the truth is we have choices. We choose the job, we agree to overtime, we opt to stay in demanding careers. Our children need us to choose wisely. Just as our children needed our physical support when they first learned to walk, they need emotional support as they toddle unsteadily toward an unknown future as teens. Contrary to popular belief, teens want support. They relish our non-anxious listening, compassion, encouragement and judgment-free counsel. Children and teens are far less resistant to our support when we affirm their autonomy and problem solve with them. Yet, deep inside an adolescent is a powerful need for independence. Teens’ passion for freedom should be regarded as an inherent drive that moves them out of the house and toward responsible self-care. Rather than fight their lust for independence, work with it. Give your children the freedom to rise and fall, while maintaining boundaries that protect them from serious injury. Let them know that your strong arm and friendly counsel are available— but only if they ask for your support! 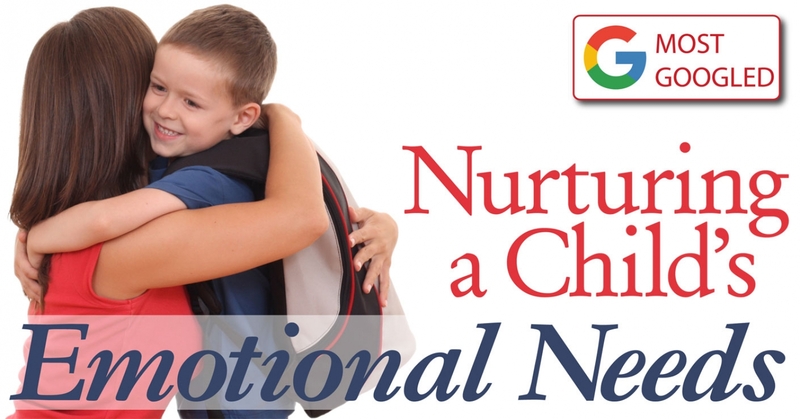 Meeting our children’s seven emotional needs lays a foundation for their future. A dependable source of love and safety develops a healthy capacity to trust and an accurate self-image, which in turn provides children with the tools they need to overcome life’s adversities and enjoy its benefits. With a full emotional tank, children are ready to tread the road before them.